Flowers are blooming. Everybody has a lighter pep in their steps. Baseball season is back in action. But if you're not a baseball fan, there's so much more happening in April in Chicago if you plan on visiting. • Boots or galoshes to keep your feet warm and dry because it rains a lot. • Dress in layers because Chicago weather can be unpredictable. It’s also notorious for dramatically dropping or increasing in temperature by 20 degrees or more in one day. • Don’t forget a lined spring coat, as well as sweaters and scarves. • The weather should be finally warm enough to explore outdoors during one of the many walking and biking food tours. • There is a chance of flight/travel problems if a rainstorm comes through; here's where to dine and drink if you get stranded at Midway or O'Hare airports. Book A Splash & Crash Weekend Party. The chic Acme boutique hotel offers comfort, rock ‘n’ roll style and affordable prices. Its new Splash & Crash weekend package is for those who dig the idea of skiing, but would rather skip the cold--and slopes. Book five rooms plus two hours of Bunny Slope hoopla, starting at $1,200 or lock-in 10 rooms and two hours of fun for $1,800. Club and Suite Retreat. 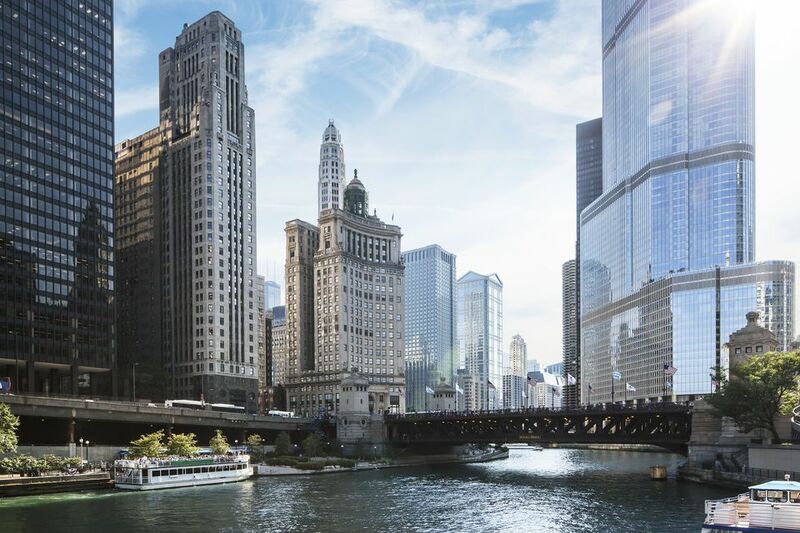 The glorious Langham Chicago is ideal for a romantic rendezvous, especially because your package allows you a spectacular view of the Chicago River. The best way to experience the Langham is to book a minimum of two nights in one of the club level rooms or suites. That'll allow access to the club lounge, where guests get a complimentary daily breakfast for two, evening cocktails, VIP amenity, personalized butler service and hotel credit of $100 per day. That may be used toward spa treatments and parking. Don't miss working out in the Fitness Studio—if that's your thing—because there's an incredible view of the river from the equipment. Also, the 67-foot swimming pool, with twinkling lights overhead, is quite remarkable. Family Fun Package. Because of the infamous Roof cocktail lounge, most folks think of theWit as a party hotel. It's also very family friendly as it offers a family fun package and is close to many attractions (Art Institute, Goodman Theatre, Chicago Symphony Center). Included in the package is breakfast for four, premium wifi and late checkout. Wellness at St. Jane. Continue your fitness routine, with a stay at the lovely St. Jane hotel, located in the historic Carbide and Carbon building. This $45 add-on amenity includes fresh juices, kombucha, Topo Chico mineral water, a season fruit plate and a yoga mat. Very Important Pups Package. Thompson Chicago's newest program features a premium service that pampers your pooch. It comes with branded food and water bowl, dog toys and bandana upon check in. There are also customized dog bones, dog bed, shopping passes for 15 percent off at the Tails in the City pet boutique and a "Pets in the City" guide to Chicago.